Well, there it is. 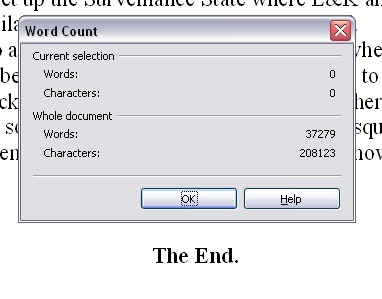 I typed the end, and then I typed ‘The End’, and then there it was, done. How do I feel? Relievedexcitedproudsmug? No, none of the above, really. Maybe a little relieved. And starting to worry about what to do next, already. And a little bit drained. But I think that’s just how I feel at moments like this. Here’s a blog about the last time. A sense of satisfaction will doubtless creep in. Do I think this project was a success? Yes, I do. I learned a lot, and achieved my target – a book between 35,000 and 50,000 words in length, which meets various criteria, and is a good addition to my writing portfolio. Do I think the book is a success? I have no idea. It needs to settle for a while, and then I’ll re-read it. I think it has merits, I have yet to see whether those merits are apparent on a read-through. What do I do next? I put this project in a drawer, and return to editing some other fiction from a while back – By His Own Hands, Evidence of Shipwreck and ‘This Disappointing Hades’. And I’ll probably have to start looking for a third part time job. I’ll try getting by on just the two to see how it goes, but 20 hours a week doesn’t earn you a life of caviar and champagne, here in 2012. (If anyone knows of any appropriate positions for a literary sort, it would be hugely appreciated if you let me know). And I have a lot of other projects I want to start. A huge sprawling fantasy novel, for one thing, and I’d like to start doing some less rushed articles here on Reasons again, too. It would also be nice to get back into fiddling around with some visual art / music / poetry too. And I should probably catch up with the real world again too. Sorry about these mumbles, I’ll write a better summary soon! It just felt appropriate to write a conclusory piece on the conclusory day. In the meantime, I’ll leave you all with a little research gem I stumbled across right at the last: Wikipedia’s archived copies of the London Gazette! This one’s from August 1822, but they have an enormous, fascinating archive. Congrats, yo. Out of curiosity–is there a monitoring process for this with your scholarship-ing? Like, is your blog technically part of a portfolio for this project or some such? I have to submit a report to the Carnegie trust who fund the scholarship at some point in — November, I think. So that will be these blog entries, the MS itself, and an ‘artist’s statement’ summarising the whole project.